Virginie came to Maribor within Erasmus+ programme through ZNI, to work in Urbani Spa as a masseuse. She spent her first preparation week on language courses, learning English and Slovene, and also getting to know the city by visiting its various museums and restaurants. Work came next: under the supervision of her mentor Lea during the next few weeks, she did the massages to her clients in Urbani Spa. She also participated in making different kinds of hair-styling, cosmetics and body care. In her free time she visited other parts of Slovenia, plus Vienna, the capital city of Austria, one of its neighbour countries, having a really wonderful time. Meet Justine, our participant from France. Justine came in Slovenia by ZNI program and she is working and gaining experience in the field of hotel tourism in Maribor. She is surprised that the receptionist's work is so diverse and interesting. Colleges at work are very nice to her and she learnt at lot from them. In the free time Justine likes to hang out with new friends and she is very active. She likes to discover Slovenia and near countries with other participants. 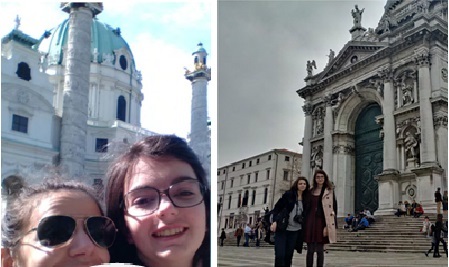 She already visited Ljubljana, Bled, Vienna (Austria) and Venice (Italy). "There was very interesting cultural exchange. We also laugh and joked a lot about our cultural differences and about ourselves as well", said Justine. Baptiste is from France and he works in IT Center in Maribor. Enjoying his working environment and getting to know the collective, he is also having fun with his co-participants from France, going out in the evenings and also visiting other Slovenian cities and touristic resorts. One of them was Bled, which amazed Baptiste and his fellow friends with the beautiful environment, enabling them to enjoy the surrounding nature and have a truly relaxing time off from the city rush.